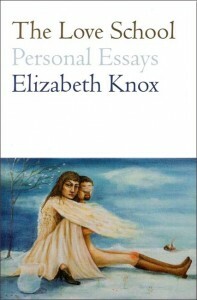 The Love School collects more than twenty years’ of Elizabeth Knox’s non-fiction. These frank and revealing essays and talks tell the story of her writing’s beginnings in childhood imaginary games played with her sisters and friends; of leaving home and working at Inland Revenue to earn money to write; of the writing and putting away of the two novels that came before her prize-winning debut, After Z-Hour, in 1987; and of the extraordinary novels which followed. Here is Wellington in the eighties: lives led in now demolished buildings, the pastimes and politics of the period described with vivid particularity, passion, wisdom and a sense of the absurd. In these pages the reader will encounter the comic: possums who invade and occupy a portion of the author’s Brooklyn flat; the dramatic: the Red Squad at the intersection of Rintoul and Riddiford Streets on Wellington test day; and the mysterious: an angelic stranger in a Venetian back street. It is quite dizzying to be rewarded for something that I’ve done for years despite many discouragements, including some that were financial or at least employment-related – bouts of debt like persistent ill health, part-time jobs with occasionally bullying managers, or simply a feeling of having failed to help provide for my family. It’s wonderful to earn ‘real money’. And I say as much when asked – how odd, how delightful, how unexpected, I say. Export earnings, I say, congratulating myself on behalf of my country. And, because I’ve always found that facts are more marvellous than mystification, I usually explain how a standard publishing agreement works, regarding money. Whoever I’m talking to then does the sums. I’m innumerate – I can’t subtract, divide or multiply (though my son thinks I only pretend not to know in order to avoid helping him with his homework). What is disconcerting, however, is that if I am asked about money in the course of an interview, and I answer, it’s money that leads the story, it’s money that is the story. At the Booksellers’ Conference in Christchurch in 1997 I told a famous Kiwi historian about my American agent’s hopes, plans and projections for The Vintner’s Luck. He asked, ‘Elizabeth, have you sold out?’ I had been, till then, showing every sign of devolving into a ‘literary stylist’ and a ‘writer’s writer’. This was OK, I was told, because, after all, wasn’t I writing principally for myself? I was always baffled by the idea of ‘writing for myself’ – how nonsensical, like the right hand not knowing what the left was doing; the left hand being capable of ambushing and astonishing the right. Or, perhaps, I wrote ‘for myself’ because I was the helpless victim of my artistic metabolism, which I experienced as an obsessive compulsive disorder, the itch I must scratch. How strange it was, I thought, staring at the historian, to go from solipsism to selling out with no territory in between. I can’t imagine myself climbing any nearer to Paradise than those souls Dante meets in Purgatory, whose sins are an excess of love.